Sealed vacuum space between inner and outer shells. Outer shell is constructed of durable, lightweight aluminum. Vacuum space is filled with technologically advanced insulation. Thermally insulated necktube core minimizes liquid nitrogen loss. Sturdy aluminum interior. 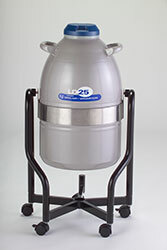 The LD series of cryogenic dewars is designed for storing and dispensing small amounts of liquid nitrogen in material science and biological cryo labs. The series includes a beaker style dewar with a wide mouth and pitcher style model for easy pouring. Neck I.D. 1.2" 5.6" 2.0" 2.5" 2.0" 2.5" 2.5" 4.7"
Dimensions Height 17.0" 17.5" 23.5" 25.8" 22.9" 26.3" 32.4" 26.8"
O.D. 7.6" 7.6" 11.4" 15.6" 15.5" 18.8" 18.8" 18.8"
The High Capacity (HC) Series Dewar Refrigerators by Worthington Industries (formerly Taylor-Wharton) are designed for storing large quantities of a variety of materials at or close to liquid nitrogen temperature. The VHC35 model is convenient for storing frozen samples in a cryo-EM lab. 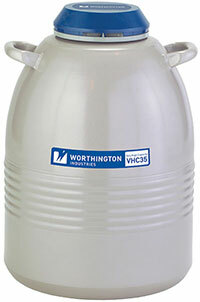 VHC35 dewar features a wide 4.7in diameter neck for better visibility and easier access and six 3.7in wide canisters (with a possibility to add a seventh canister for extra storage capacity), all in a relatively compact form. 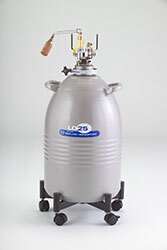 A 10 or 4 liter dewar flask (#81750-10, 81750-4) can be used to conveniently maintain the level of liquid nitrogen without disturbing the stored samples. A special roller base (#81750-35-1) greatly helps with mobility. The CX100 Dry Shipper Dewar from Worthington Industries is the only cryo shipper endorsed by a major cryo-electron microscope manufacturer. The unique adsorbent material inside prevents a liquid spill if the dewar is tipped over, while the storage temperature inside the chamber is maintained at -190C. The samples are kept inside a standard Worthington dewar canister. Two outer cases are available for shipping the dewar; the square case is sturdier, more stable and is preferred in most cases. 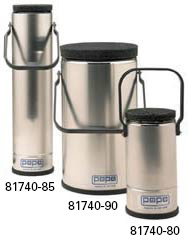 Complies with IATA regulations for open cryogenic receptacles. The lid can be locked; Temperature loggers are available. 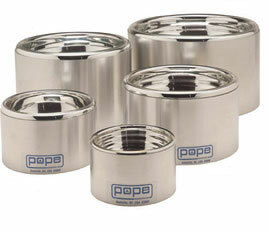 Pope Dewars are ideal for temporary storage of Liquid Nitrogen in laboratory settings. These Dewars are the lab standard in glass lined, fully silvered Dewars. They are readily available in a variety of standard shapes and numerous sizes. We have cylindrical, narrow-mouth, hemispherical, along with convenient low-form shallow styles. Extended base and handle versions are also available. 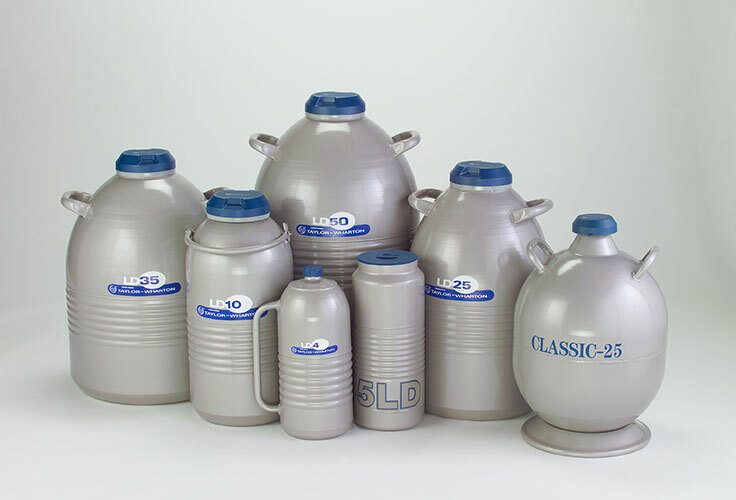 Low Form Shallow open top Dewars in Cylindrical and Hemispherical configurations are available in popular sizes to match standard flask sizes. Fully silvered glass Dewars are based with tip-offs off center for use with stirrers. The traditional Lab Grade Dewar line encompasses a full range of sizes of fully silvered, glass double-walled evacuated flasks. The wide mouth cylindrical Dewar is available with a choice of either protective mesh or extended aluminum housing and also the popular narrow mouth spherical configuration. Lab Grade Dewars for benchtop use come with polyethylene lids. Handled Lab Grade Dewar offers a complete Lab Grade Dewar at an affordable price. The most popular wide mouth cylindrical Dewars are manufactured with a full extended aluminum base, full exposed lip and attached handle to facilitate portability, safety and convenience. Pope Low Form Shallow (open design - no lid) Dewars permit essential operations not practical with standard cylindrical or spherical Dewars. The protective aluminum bases on both styles extend the full height of the Dewars. Note that protected vacuum tip-off tubulations are offset to the side to minimize space between the Dewar bottoms and magnetic stirrers. The hemispherical line has been expanded to provide additional Dewars to fit larger flask sizes. Economies in coolant use will be realized in all operations where Pope Low Form Shallow Dewars are more practical. Cooling range from dry ice/acetone to liquid nitrogen. Pope Low Form Shallow Dewars are available in several sizes and two configurations, hemispherical and cylindrical (with semi-flat bottom). The cylindrical configuration increases coolant capacity. Holding time 2-6 hours depending on volume. Foam dewars provide a neat and handy alternative to heavier vessels or the commonly utilized styrofoam shipping containers. The special foam material is chemically inert and mechanically durable enough to be exposed directly to liquid nitrogen, without leaking or degrading. Patented design makes the foam vessel easier to handle and safer to use than a traditional low profile glass dewar. 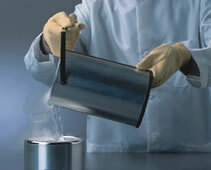 Because of its lower thermal mass, a foam vessel will cause less liquid nitrogen boiling when it is filled. The foam surface will also accumulate less frost. As a result, less liquid nitrogen is consumed. Available as 500ml, 800ml and 1400ml Cryo Cups featuring convenient protruding handle, a Tall (1800ml) vessel, and a Mini (130ml) vessel. Efficiency assured by rigid bakeout and evacuation control (evacuated to 10-5 torr or better). Evacuation tip completely shielded for increased protection. Weighted bases on all models for stability. Optional full length metal housing on most models for added protection. No pads between walls on cylindrical Dewars eliminating this heat transfer potential. Supplied polyethylene stopper tops off Dewars to minimize evaporation. Holding time 2-6 hours depending on volume. Pope Lab Grade Dewars are rated the most efficient glass Dewars in the World. Designed for use with Liquid Nitrogen, this superior ranking is due to rigid quality controls in manufacture and a number of outstanding design and manufacturing features. The protective aluminum bases on both styles extend the full height of the Dewars. Note that protected vacuum tip-off tubulations are offset to the side to minimize space between the Dewar bottoms and magnetic stirrers. These Dewars exemplify the emphasis placed on both efficiency and safety by Pope Scientific. All Pope Lab Grade Dewars are manufactured of borosilicate glass for liquid nitrogen service. A sturdy mesh cover facilitates a firm grip, provides a cushion against bumping and increases protection. Holding time 2-6 hours depending on volume. All Wide Mouth models can be obtained with an exterior metal housing that extends nearly to the top rim of the Dewar (a slight extension of the glass Dewar facilitates pouring). This housing adds the safety of metal to the efficiency of glass, particularly important in handling operations. Holding time 2-6 hours depending on volume. Aluminum metal housing extends full length of Dewar for added protection. The Dewar lip is extended to facilitate pouring. 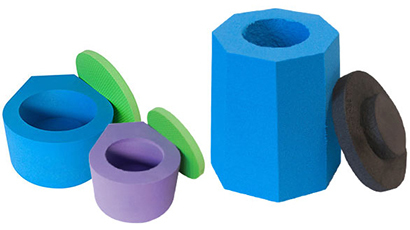 Polyethylene stopper, specially vented, minimizes evaporation. Holding time 2 - 6 hours depending on volume. These dewars are ideal for temporary storage of liquid gas in laboratory settings. These flasks incorporate the convenience of a coated handle on the most popular wide mouth cylindrical models. These Dewars are priced only slightly higher than the standard models and afford the increased portability, pouring efficiency and added protection. All the features in one complete Dewar!